Originally uploaded by Laughing Squid. SXSW has been fun and schmoozy so far. 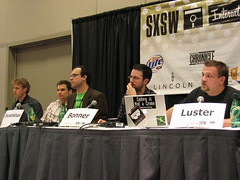 This is the only panel I caught Saturday, Blogging without Borders. Jonas Luster moderated a group that included Hossein Derakhshan, an Iranian blogger living in Canada. Hossein made the point that many middle class Iranians do blog from Iran despite the Mullahs (which he equates to corporations in America in their control over society). These blogs represent a voice of the people that is all but ignored in the mainstream American media and the Bush Administration which is increasingly ratcheting up its militant stance against Iran. And then after all the serious stuff there were parties, and more schmooziness which you can see much of by perusing these Flickr pix.